Ephemerella infrequens and E.inermis, PMD's hatch mainly in June and July in the morning or evening. The insects like to emerge in a water temperature of 55 to 60 degrees. A hatch may occur midday when the weather is overcast. The adult insect has a pale green to yellowish body with pale gray wings in the size of 14-16. 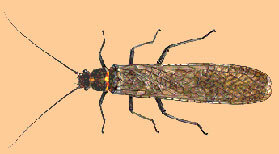 The nymphs are olive-brown with three tails and rectangular bodies. Inermis will hatch first followed by Infrequens. The nymphs will slowly swim to the surface during the time of emergence. They often get trapped within the surface film prior to emerging as a dun. PMD's reside in the riffles, runs, and flats of moderate streams. Baetis, BWO's start hatching in late September and peak in November.The lower Kings River will have a hatch continue through January. The BWO's restart a hatch when the weather warms up in May and June. The hatches occur in the early afternoon , especially on drizzly days. Nymph activity is prevalent in the early morning and early evening hours. Good BWO areas are Kings River, MF and NF Stanislaus, San Joaquin, and Toulumne Rivers. Baetis are dark olive with a gray wing. Most BWO's are size 18-20 but size varies and it is important to match the size. The nymphs swim to the surface and often get stuck in the surface file. Cripples and Emergers are important patterns for this hatch. BWO's will be found in all free-flowing streams and are heaviest in streams with stable flows such as tailwaters, meadow streams, and spring creeks. Pteronarcys, these nymphs live 2-4 years in the water. They seek streams with moderate to fast currents and live within riffles and bouldered areas. 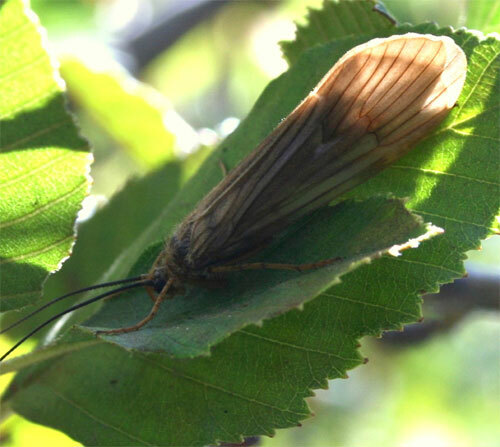 On the Westside Sierra, The King's and Merced are known to have salmonfly hatches usually during April. The major problem in fishing these rivers during the hatch is the water level is usually too high from Snow melt. In Spring, the larvae crawl up to the banks and out of the water to transform into adults. Often they fall back into the water. The adults are large, 2 1/2 inches, with two pairs of wings and an orange body. Adult activity is in April and May and can last a few days to three weeks. The hatch will start when the water warms up, usually late morning, and will work itself upstream. Female adults will often deposit their eggs by dropping down to the water during the late afternoon or early evening. After depositing the eggs, many females end up in the water starting a feeding frenzy among the trout. Larva activity is best in the Spring and Fall. Zygoptera, Damselflies prefer lakes and ponds but will also be found in slow moving streams . The nymphs hatch from eggs laid on subsurface plant material. They move through the water at a slow pace by undulating it's entire body. Below the abdomen are three gills which also help create movement. Usually the nymph will hang within the water column so that a Chuck and Sit Presentation will generally be more successfull than retrieves. The colors of the nymph will vary from Green to Olive to Brownish hues depending upon the time of year. The adult rests with it's wings folded over it's body. Female damsels lay their eggs by crawling down plant material into the subsurface environment. She carries a volume of air trapped by her body to respire and will be carried by the air bubble to the surface after laying the eggs. Trout will key in on this since many adults get trapped within the surface film. Good hatches at Alpine Lake. Hydropsychid, A Net-spinning caddis whose larva, similar to Green Rockworms, are available through most of the year within moving streams. Usually pale green or tan , these caddis spin silky nets in the crevices of rocks using bits of materials available within the stream. The larvae can be fished throughout the year. Adults hatch in June and July by pupa coming to the surface with a bubble of gas. 1-3 three weeks later, females will swim down underwater to lay eggs. The Leadwing Coachman or Hare's Ear is used as a wet fly to imitate this ability. Spotted Sedges are most often found within riffles and runs. 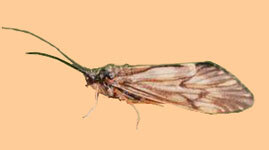 Caddis are present in almost every stream. During the early evening hours, what appears as a massive hatch, is acutally the females depositing eggs. Wet flies can be your best bet during these hours. Good hatches are within King's River, San Joaquin, and MF & NF Stanislaus River. Dicosmoecus atripes, October Caddis hatches can start in late September or occur in October, maybe into November. Often, it is timed to the first strong frost of the Fall and will occur for about 1-2 weeks. October Caddis inhabit freestone streams and some tailwaters with medium to strong currents. You will not find them in streams with silty bottoms. The larvae migrate close to shore just before pupation and will form colonies. The larval case for pupation will be made up of pebbles and the new pupa will emerge and crawl or swim towards shore, climbing rocks and vegetation. Try fishing the banks near vegetation. They will not swarm but you will notice individuals as they are big. After mating, the females will lay eggs in the water near the edges of the streams in late afternoon to evening. Most dry fly presentations are made with a dead drift using a Direct Upstream method. If this does not work well, try skating the fly working the riffles and current seams. Hatches seen on Mokelumne, Calaveras, Upper SF San Joaquin Rivers. Glossoma, these are small case-type caddis with a dome-like case made of pebbles firmly attached to rocks. The larvae outgrow the cases and must discard the old case to build a new, larger one. This action occurs on a weekly basis, usually under low light conditions such as early morning or dusk, and leaves the larvae vulnerable to trout. Found in moderate- to fast-current shallow streams. The larvae themselves are cream-colored while the adults are a light tan or brown. The larvae will undergo a pupation prior to becoming an adult. The pupa will be orange colored and will swim within the slower waters below the riffles. After two days, the pupa will rise to the surface about an hour after sunset and emerge as an adult. The female adults swim back down to lay eggs on the stream bottom just after sunset. Time your fly selection according to the rises. During a rise, work an emerger pattern with an Across and Down presentation just below the surface. After the rises end, switch to a deep sparkle pupa using a Dead Drift presentation. The dry fly can be used after the hatch ends and also throughout the day. Brachycentrus, This is a case-making Caddis that creates chimney-like cases composed of pine needles, bark, or other plant material. The cases are often 4-sided with distinct corners. The larvae lay inside the case, often green with a black head. The caddis live in moderate to fast riffle areas of streams and anchor themselves to rock or twigs with a white silky thread. The larvae will feed upon algea on the rocks or floating within the current. They will use the thread to position themselves into good feeding areas of the stream current. Flyfishermen will use a white grease pen to mark about 12 inches of the tippet to imitate this thread. Pupation occurs during late Spring and early Summer. The pupa will crawl along the streambottom and let the currents carry them to the surface, often upon a bubble. The trout will key on this emergence. Use a Across and Down presentation just dragging beneath the surface with a few twitches. The adults will come back to the stream late afternoon, after mating, to lay eggs. They will lay eggs on the surface if they can't break the surface tension, others manage to swim down and attach the eggs to underwater objects. These adults will usually become spent upon the surface. There are two species, the Mother's Day Caddis (B.occidentalis) hatches in May through July and the American Grannom (B. americanus) hatches in the Fall during September and October. Hatches usually occur in the early morning and early evening. Rhyacophila, As you'd expect, it's green and looks like a worm in the larva stage. 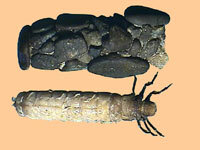 The larvae live in fast-current freestone streams. They prefer riffle areas with rocky streambeds and good aeration. The larvae are predaceous and will hunt for mayfly and midge larvae among the rocky bottoms. 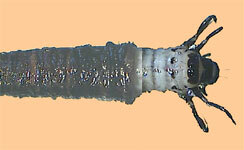 Often the larvae are swept into the current and are available to the trout. The larvae makes a shelter to pupate, then cuts itself free to ascend to the surface. During this ascent, the olive-colored pupa (size 10-16) are extremely vulnerable to the trout, and they immediately free themselves of their shuck to become adults. Cripples and emerger patterns are ideal during this stage. Adults will hatch in the afternoon from June to August. The adults tend to be dark tan to green, almost black in sizes 12-16. This caddis offers many opportunities for dry flies since the adult likes to land on the water surface weeks after hatching and swim to the bottom to lay eggs. Wet flies are a good choice to mimic the swimming action of the adult. Hesperoperla, The nymphs are large and live in rocky riffles with moderate to fast water. They are a mottled color of tan, black, and brown. The nymphs crawl onto exposed rocks and emerge. Females return in late afternoon to lay eggs. Chironomidae, There are over 45 genera of chironomids in California alone. For our purposes, group them into Chironomids and Bloodworms. Both are found in lakes, ponds, and slow-moving streams such as Spring Creeks. Within the Sierras, they are prevalent within our alkaline lakes on the Eastside. Bloodworms are so-named since they carry hemoglobin which allows the insect to survive in poorly oxygenated water such as lake bottoms. Chironomids can be found in a number of colorations from Black, Olive, Gray, and Tan. The densities of these larvae can exceed fifty thousand per sq meter of lake bottom. Emergence occurs year-round. The larvae frees itself from the mud burrows and rise to the surface with a gas-filled pupal sheath. The pupa breaks through the water surface and an adult emerges to fly away. Trout will feed on the ascending pupae primarily within the lower water column, perhaps 6-12 inches off the bottom. During low light conditions, such as evening, the trout will feed upon the emergers near the surface. Good Hatches occur at Hume Lake. Isoperla, these are small (1/4 to 1/2 inch) light tan to bright yellow stoneflies that hatch in late Spring to late Summer. Usually found in mid- to high-elevation streams with rocky bottoms and fast currents. Like typical stoneflies, the larvae crawl upon the rocks and emerge from their shucks. Females return in late afternoon and through the evening hours laying eggs. Speckle-wing Mayfly, this mayfly prefers the quiet waters of lakes and ponds, particularly those stillwaters with prevalent weedbeds. Generally they range from size 12 to 16 and come in colors of olive, tan, and brown. Hatches begin in late Spring, around May and continue through the Summer. The Late Spring hatch should be the larger sizes while the last Summer hatch will be your smallest size callibaetis. The hatches are best during overcast skies, or even rain. Generally, the major emergence periods are spaced about 6 weeks apart. Hatches usually start around 7:00 a.m. with nymphs congregating at the bottom. 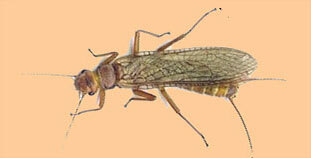 Around 11:00 a.m. and throughout the mid-day, concentrate on emerger patterns and dries. Spinner Falls can occur at any time during the morning hours. Use a Lift and Settle presentation for the nymphs.